Having spent a combined seventeen years practicing law at one of the largest international law firms in the world (over twenty-five combined years in practice total), Mike and Dustin are experienced litigators that have represented clients in intellectual property litigation throughout the United States and in proceedings before the U.S. Patent and Trademark Office. Mike and Dustin are registered to practice before the U.S. Patent and Trademark Office and have prosecuted U.S. and foreign patent applications and have assisted clients in securing IP rights in accordance with copyright, trademark, and trade secret law. 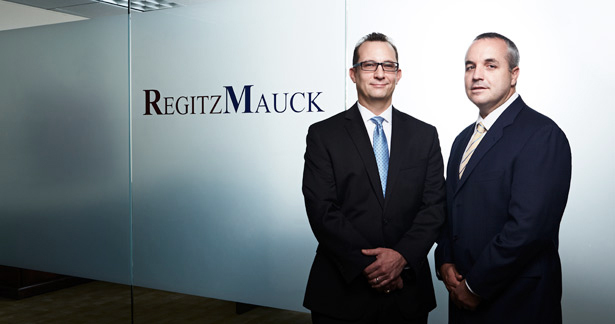 With over twenty-five years of combined experience in intellectual property law, RegitzMauck is committed to understanding client needs and developing legal strategies to achieve client objectives at the lowest total cost to the client. By embracing technological advances that have streamlined the practice of law, the firm is able to provide value-based legal representation without sacrificing legal quality. Mike and Dustin have represented U.S. veterans in various legal matters since their former firm co-founded the Veterans Legal Clinic in Dallas in December 2009, and both are members of the Veterans Outreach Subcommittee of the Dallas Bar Association. RegitzMauck believes that those that have sacrificed so much to protect our legal system should have full access to it.